Denis Cometti is perhaps the most widely known and respected commentator in the business. He has won the Australia Football Media Association award for Most Outstating Television Caller eight times. His wit and charm is legendary and remarkable. Many of his Cometti-isms such as ‘centimeter perfect’ and ‘that’s ambitious’ have penetrated their way into the common language of footy fans. Cometti began his career in 1968 as a disk jockey with Radio 6KY then Radio 6PM, Melbourne’s 3DB and 6PR Perth. 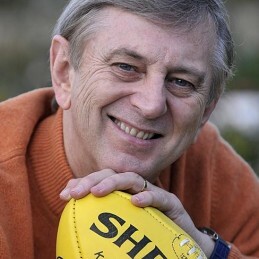 His first sporting event was in 1972; a football match between Western Australia and Victoria on Radio 3KZ. In 1973 he joined the ABC where he commentated a range of sports for 13 years but became best known for his call of cricket. Surpassing his mentor Alan McGilvray, he rejected an offer of succeeding him and returned to football, his first love, calling games for Channel Seven. A former Australian Rules footballer himself, Denis played his first game for West Perth in 1967 as a ruckman. The following year, as an 18 year old, he played as a ruckman/forward and finished the season fourth on the league goal kicking list. Denis went on to coach West Perth from 1982 to 1984, taking the club to third place in this first year. Eloquent, distinctive and unmistakable, Denis is one of the most beloved and respected commentators Australian sport has ever heard.